SOE hosts MP Makhzoumi, geoscientists and financial experts for oil and gas panel discussion. The panelists from left: Dr. Karam (moderator), Wissam Chbat, MP Fouad Makhzoumi and Talal Salman. 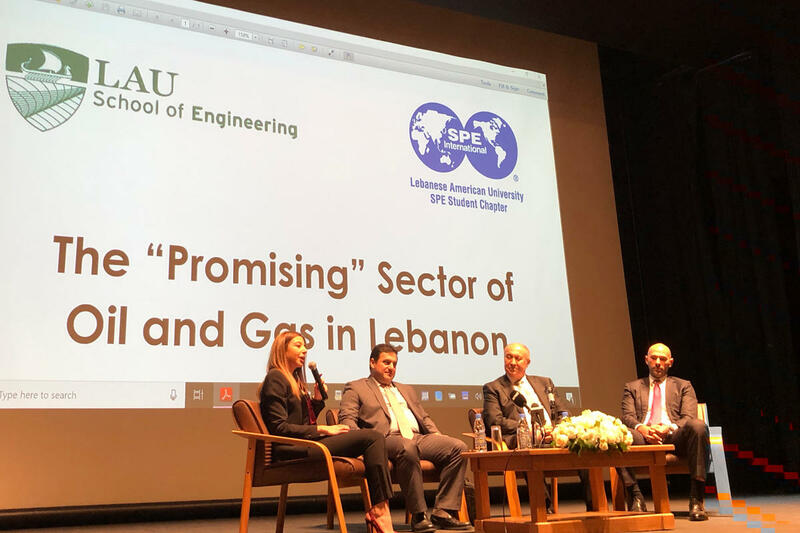 In collaboration with the School of Engineering (SOE), the recently established LAU student chapter of the Society of Petroleum Engineers (SPE) organized a panel discussion entitled The Promising Sector of Oil and Gas in Lebanon to touch base on the topic from several standpoints. The event took place on Beirut campus on January 30. Petroleum engineering student Fouad Al Kadi delivered the opening remarks, inviting President Joseph G. Jabbra to the stage. “We have a national treasure that would respond to all the needs of our society,” declared Dr. Jabbra, dubbing the natural resources “our last opportunity that we should live up to.” He urged attendees “not to give up hope on this golden national treasure,” as long as there are people out there who have taken it upon themselves to look for the answers. President of the SPE LAU Student Chapter Omran Nawfal is one of those people. “I have taken it upon myself not to graduate without founding this chapter,” he said, offering background on how he worked with his peers to disseminate knowledge through community service events and technical workshops in collaboration with other clubs and societies across the country. As president of SPE Lebanon, Dr. Nasser Hoteit later clarified that the network is vast. “SPE worldwide spans more than 150 countries and includes over 150,000 members, 72,000 of whom are students.” He also presented extensively about the regulatory aspects of the oil and gas sector, prior to the panel discussion. Part-time SOE faculty member Thereza Karam then moderated the panel, which included Lebanese Member of Parliament Fouad Makhzoumi, Geophysicist and Board Member of the Lebanese Petroleum Association Wissam Chbat, and Project Director at the Ministry of Finance United Nations Development Program Talal Salman. The panelists presented on the entrepreneurial, geoscientific and financial aspects, respectively, raising factors that are considered encouraging for the Lebanese oil and gas sector while outlining hurdles and drawing on the experience of other countries. MP Makhzoumi stressed the importance of “thinking differently about petroleum in Lebanon, as it requires transparency, accountability and close civil inspection,” calling on the parliament to play a vital role in shifting the mindset in this regard. Addressing the audience, he pointed to matching students’ skills and expertise to the needs of the sector in order for it to prosper.